Guinea declared its independence from France on 2 October 1958. Following France's withdrawal, Guinea quickly aligned itself with the Soviet Union and adopted socialist policies. After achieving independence from France in 1958, the Force Aerienne de Guinea was formed with Soviet assistance in the delivery of 10 MiG-17F fighters and two MiG-15UTI trainers. In the same era an An-2, An-12, An-14, Il-14 and Il-18V transports were delivered, Mil Mi-4 helicopters also entered service. Other eastern bloc countries deliveries included three Aero L-29 jet trainers, six Yak-11s and Romania contributed licenced built IAR-316 Alouette III and two IAR-330L Puma transport helicopters. Very little is known about early AAG MiGs operations. Time and again media reports indicated their involvement in the war that raged in Portuguese Guiné in the 1960s and early 1970. As many as 12 MiG-17s were reportedly available in 1967, of which at least six were still operational in November 1970, when Conakry come under attack by Portuguese forces. In early 1971 two Guinean MiG-17s reportedly buzzed Bissau, supposedly for reconnaissance purposes. Some reports indicated that the aircraft in question were either of Algerian or Nigerian origin, and flown by foreign personnel. Curiously, careful research through the archives of the Portuguese Air Force reveals no corroborative reports. Four MiG-17s flew over Freetown in Sierra Leone during local unrests in April 1971, and either two MiG-17s or a MiG-15UTI reportedly crashed inside Sierra Leone in September of the same year, while involved in a Guinean intervention. Both pilots were killed. Similarly, a formation of six MiGs reportedly flew over the burial ceremony for the PAIGC leader Amilcar Cabral in February 1973. In the 1970s Soviet Naval Aviation was granted facilities at the airport to serve as a staging base for Atlantic maritime reconnaissance patrols by Tu-95RC and Tu-142 aircraft. In 1974 reports surfaced concerning the delivery of eight new MiGs, together with 300 Soviet advisers that helped in the construction of the military side of Conkary IAP. 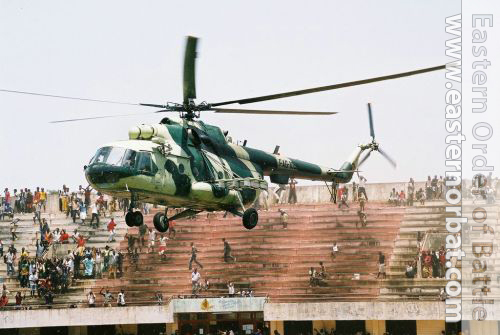 It was reported in 1975 that most of the Guinean air force's aircraft were based at Conakry-Gbessia airport. 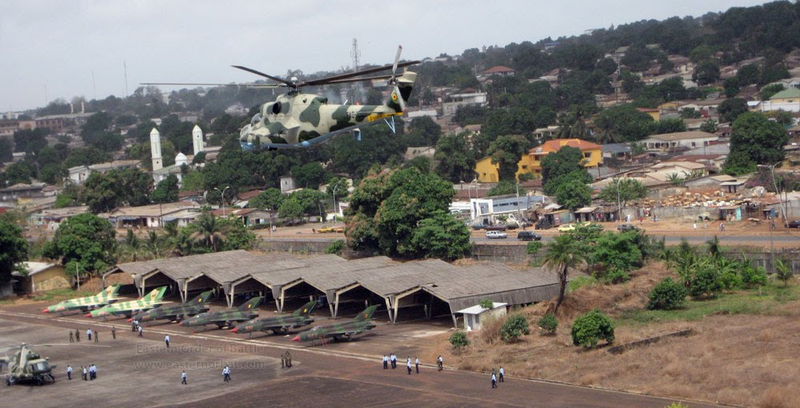 Current air-force operations are conducted out of the Conakry-Gbessia airport. Also during the seventies a group of Cuban pilots flew MiG-17s in Guinea. They helped form and train the local air force and participated in missions against violations of Guinean airspace and territorial waters. Guinea further Soviet aid was requested when Conakry Airport was opened for use by Soviet Naval Aviation maritime reconnaissance aircraft. This resulted in the delivery of one squadron MiG-21bis/UM in mid-eighties to replace the remaining MiG-17s. The transfer of the MiG-21bis tactical fighters transfer's purpose was to ensure the protection of Conakry Airport by the Soviet Naval Air Force. The MiG-21bis fighters arrived with standard factory painting, green spots on sand background at the top and light blue under. Between 1982 and 1985, several Guinean pilots were trained at the Amaury de la Grange Air Academy, a private flight school in northern France that usually trained airliner pilots. Some of these students likely converted to MiGs. However, no additional reports of AAG MiG activity surfaced for another two decades, until September 2000, when Guinea became a target of attacks for Sierra Leone and Liberia. These attacks were undertaken by a little-known dissident group, the Rally of Democratic Forces of Guinea (RFDG), backed by the insurgents from Sierra Leone’s Revolutionary United Front (RUF), and the former Liberian government. The fighting threatened thousands of Guinean villagers and nearly 500,000 Liberian and Sierra Leonean refugees in the area. Although the Guinean Army counterattacked fiercely and management to stabilise the situation, RFDG attacks claimed the lives of more than 1,000 civilians and tensions remained high for several months. 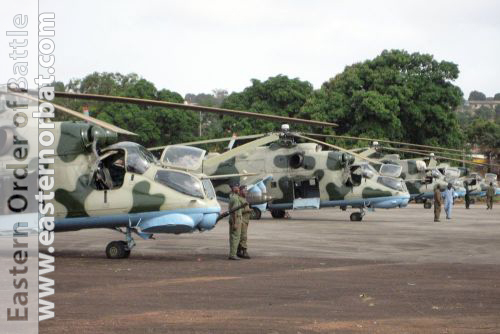 According to UN reports between 1999 and 2000 Ukraine has given over four Mi-24RCh and Mi-24K helicopters to Guinea. Before the transmission the helicopters were converted to combat version. 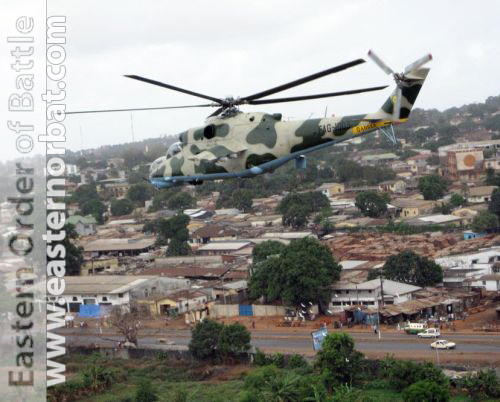 Along with the Mi-24's Ukraine delivered two Mi-8MT medium cargo helicopter to Guinea. In January 2001, the RFDG claimed to be in control of the town of Guekedou, in southern Guinea. The area came under fierce attack from the Army – possibly supported by two MiG-21s – and this proved highly successful. According to one of the captured insurgents, ‘only 20 out of 365 RFDG fighters survived’. Nevertheless, the Army continued pursuing survivors and several subsequent RFDG and RUF reports confirmed the use of MiGs, in addition to ‘Mils’ and ‘helicopter gunships’ during this operation. Reports from outside of the country indicated that a group of Ukrainian, South African and French pilots had been recruited to fly MiG-21s, freshly overhauled with – apparently – Ukrainian assistance. Until recently, Guinea's Air Force (Force Aérienne de Guinée) was theoretically relatively well-equipped, with a handful of ageing Soviet-era MiG-21s forming its principal combat component. A total of five MiGs was reportedly overhauled by Russian?Ukrainian personnel in about 2002, with subsequent attrition reducing that quantity to no more than three or four. None of these aircraft are now believed to remain in service. 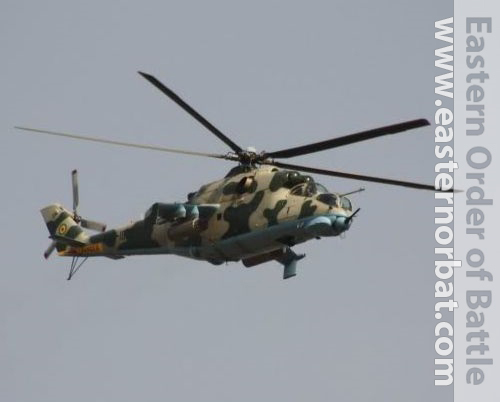 Such combat capability as presently exists rests with the Mi-24 'Hind' attack helicopters, four examples of which are believed to have been received since 1999. One MiG-21bis crashed due to an engine malfunction near Kassa, a coastal village near Conakry, killing its pilot, Flt Sgt Nama Keita, on 22 April 2004. Keita successfully ejected but drowned after plunging into the Atlantic Ocean off Conakry. Fishermen recovered the body from the sea off the west African country. Seven newly built hangar and the MiG-21bis and MiG-21UM types standing in front of it can be seen at a military demonstrations in Conakry airport in 2009.